Is it good to have a plan? 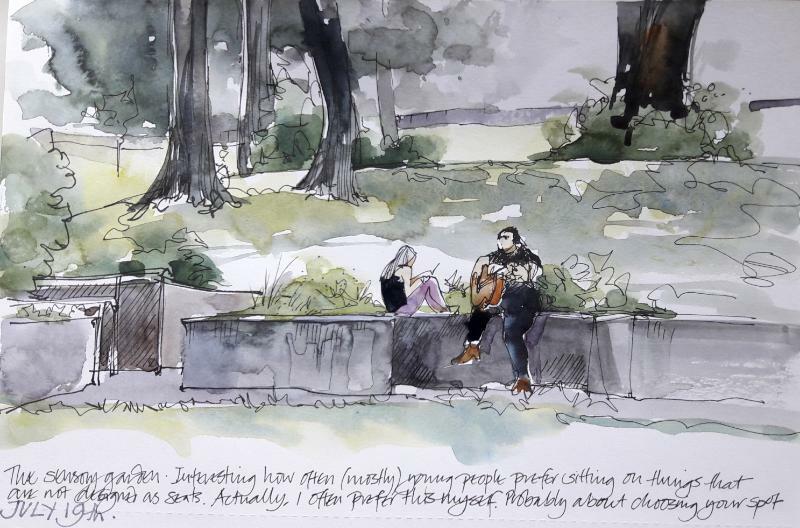 I’m continually evaluating the things I do when I go out to walk and sketch, and my sketchbook pages often end up with notes to myself that are supposed to make things clearer (which does sometimes help). I find it helps me to have a plan; but ironically at the same time it also helps if I know I’m probably going to drop all these ideas once I’m out in the park and just respond to what’s there. The big dilemma when going out for a walk with a sketchbook is how much walking to do, and how much sketching. If I go out as I generally do for about an hour, there’s only time for a certain amount of drawing if I’m also going to have a satisfying walk. Take the pages above for example – the line drawing on the left took about 3 or 4 minutes and is really not much more than a diagram but records and identifies a place. The drawing on the right was a bit of a closer investigation of what I’d just discovered and took about 5 to 10 minutes doing just the line work with a pen – I added colour when I got home. 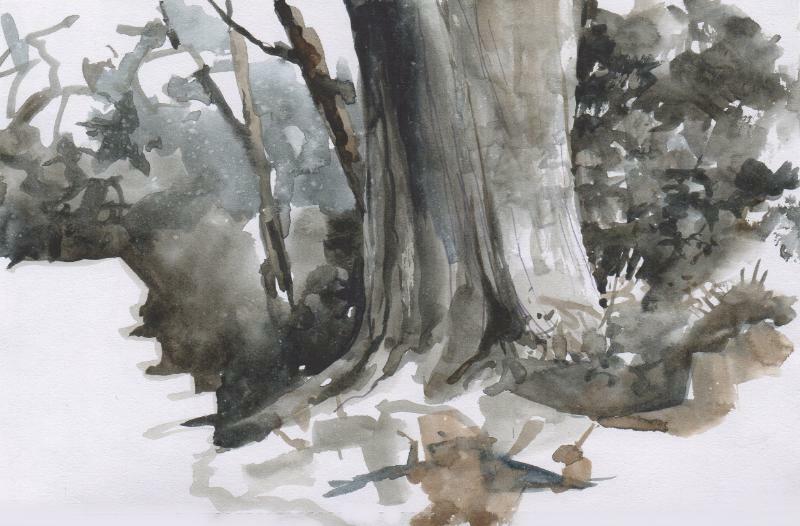 The sketch below, of a large beech tree in Moorhouse Wood was done entirely on the spot and took about 20 minutes. That may not sound a lot, but it’s a fairly large chunk out of an hour’s walk. (Sketching with a waterbrush and a tiny palette with just 2 pigments, in this case Paynes grey and Burnt Umber, for cool and warm tones is something I’ve been doing a lot recently). d) a flexible combination of all this with the addition of taking photographs whenever I feel like it. The weather has a big part to play, and so does how well I’m feeling, but I never really know for sure what’s going to happen. Something may catch my eye and before long I’m immersed in drawing, and then before I know it I find I’ve been standing sketching in one place for anything up to 30 minutes. That’s my limit though – I start to get tired and stiff. A sketch like the one below in the Garden of Life took me about that long in the open air and about the same amount of time to finish at home. It amuses me that I both like to plan ahead but at the same time to know I’m not going to stick to it. Some days I come back with several pages of sketches, sometimes just one drawing, sometimes a string of photos in my phone and sometimes nothing at all – whatever happens is just fine and it’s important to remember that. It’s what being outdoors is all about – looking, feeling, spotting what’s new, seeing something unremarkable but extraordinary, taking time without thinking. Getting lungfuls of air and feeling the earth under my feet. I love learning. I love going back to basics, doing exercises, practising. There’s no moment in any lifetime of art practice when drawing exercises aren’t a great thing to do – I really ought to do things like this more often. 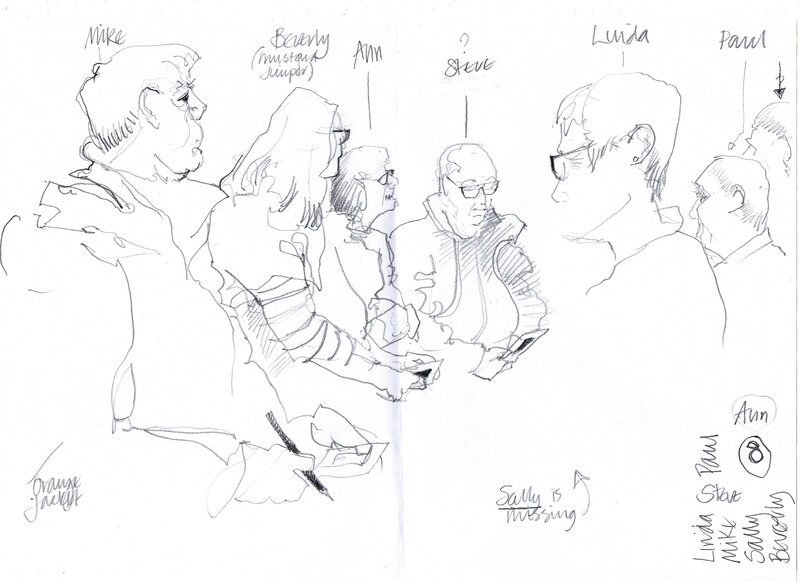 We’ve had two Sketchwalks at Cliffe Castle Park now – the first one had to be rescheduled because of snow and I couldn’t get to it, but yesterday I was able to take part. It was refreshing, incredibly useful, and a lot of fun. 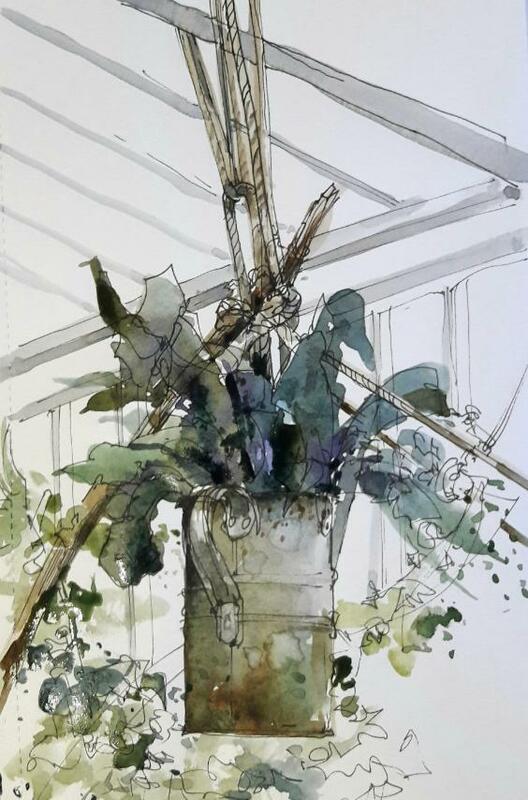 The second session was a chance to have a good look at composition, simplifying how we see when we’re sketching on location and exploring ways to organise what we draw in the best possible way. Louise had made us all adjustable cardboard viewfinders! We used them in a variety of different exercises and discovered what an incredibly useful thing this simple tool can be. 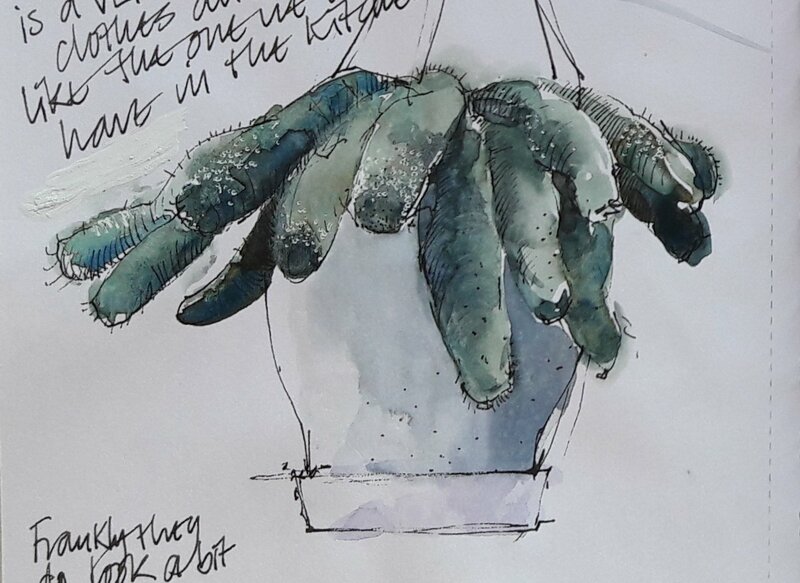 One of the things Louise asked us to do was to look at an earlier sketch we’d done previously in the glasshouses, and then draw the same object from various angles using a viewfinder. 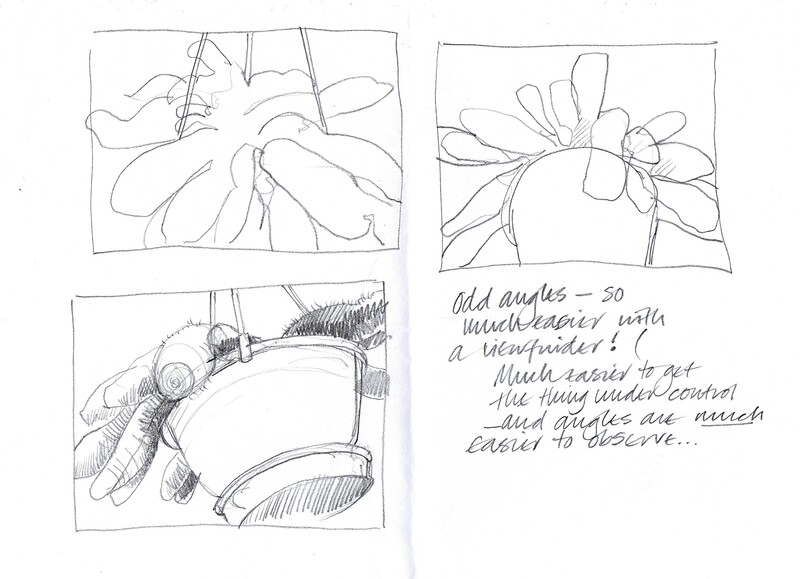 I had a sketch of a hanging cactus in my sketchbook that I’d done a few weeks ago, so I advanced on the same plant viewfinder in hand, and very quickly realised that if I’d had this handy tool with me when I drew it before, things would have gone much more smoothly from the start. 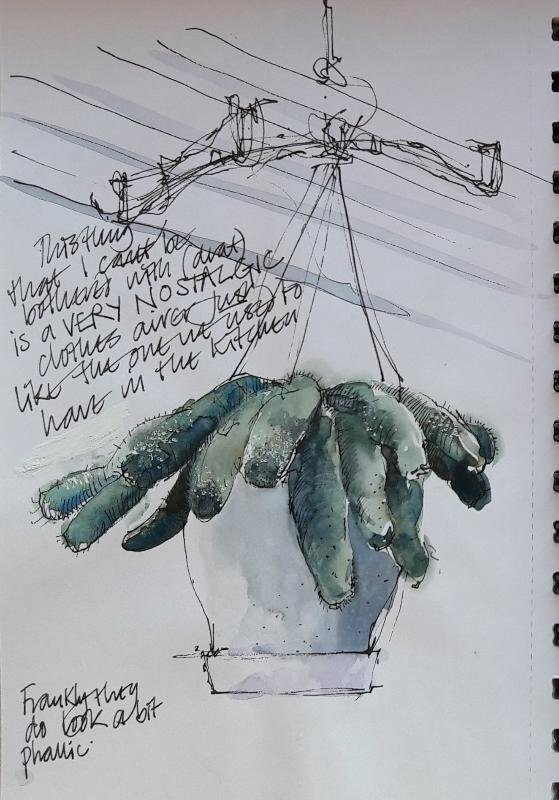 In fact, with the viewfinder I’d have been able to tackle the crazy angles of the clothes-airer that the cactus hangs from without getting all despairing about it. Lastly, I made an effort to try to record as many of our group as I could with a quick scribble – hoping it would also help me remember everyone’s names. 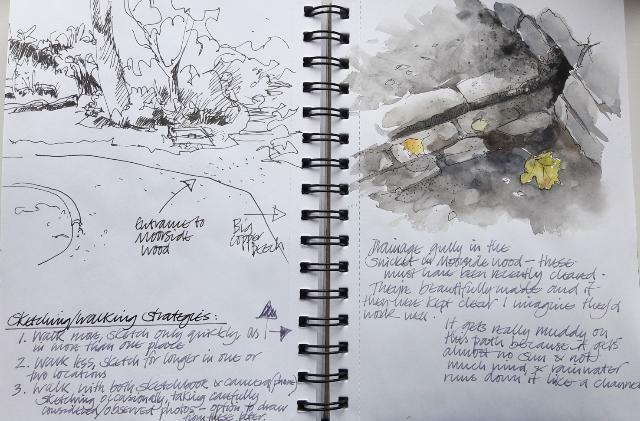 Another pair of Sketchwalks will be happening later this Spring, and judging by the way the first two sessions went and the response we’ve had they’ll be well attended. 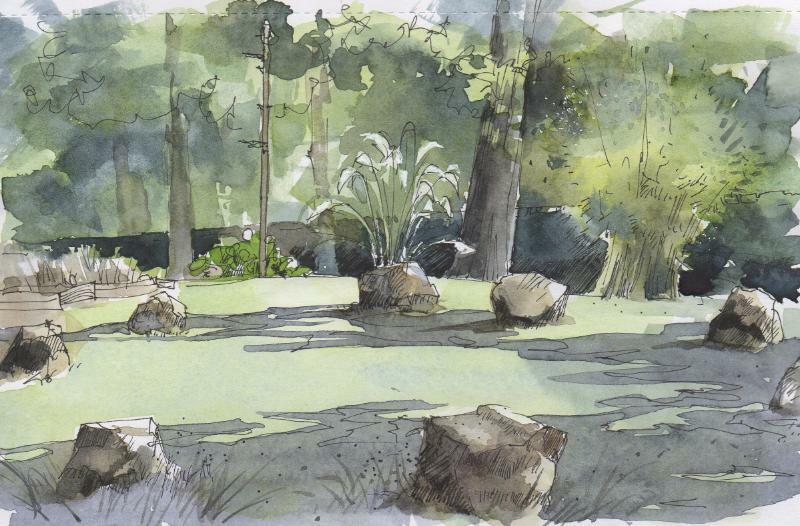 Sketching on location is getting increasingly popular and it doesn’t matter whether you’re a complete beginner or a sketcher with a lifetime’s experience – these sort of practice sessions are a real boost, and a great way to explore drawing and enjoy it in the company of others.